The Care & Share education campaign is gaining momentum as the Idaho Rangeland Resource Commission uses multi-pronged outreach methods to spread the word on how recreationists can co-exist with livestock grazing on public lands. Trailhead signs, news media outreach and a new cutting-edge web site let recreationists know where they may encounter sheep and cattle near popular trails in Boise, McCall, Soda Springs, the Wood River Valley and the South Hills near Twin Falls. Closing gates after you pass through. What to do if you encounter domestic sheep and guard dogs in particular. Leashing pets before you encounter livestock and guard dogs. 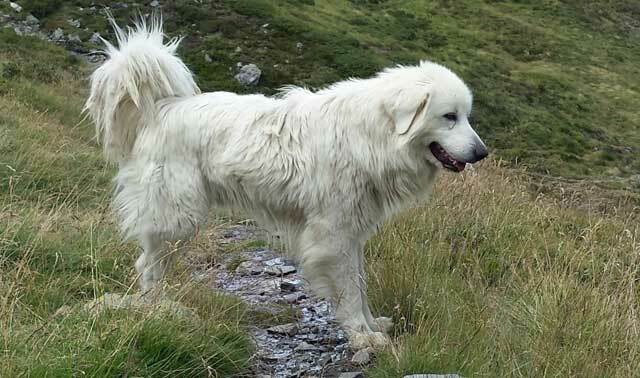 Great Pyrenees guard dogs that protect sheep herds from preda-tors view domestic dogs as potential threats … be sure to leash dogs when hiking through sheep. The Care & Share education campaign is a partnership between the Idaho Rangeland Resource Commission (IRRC), the U.S. Forest Service, Bureau of Land Management, Idaho Department of Fish and Game, and the Idaho Department of Lands. The campaign theme is: Care for Idaho’s rangelands and share them respectfully with others. IRRC takes the lead in distributing trailhead kiosk signs to state and federal land managers, and partners like the BLM and the Forest Service, along with ranchers, assist in making timely Care & Share information available to local communities. John Kurtz, Outdoor Recreation Planner for the BLM in the Shoshone District in south-central Idaho, explains how the system works in the Wood River Valley near Hailey, Ketchum and Sun Valley. “We’re at the Clear Creek Trailhead about 3.5 miles west of Hailey,” Kurtz explains. “The sheep are in here a couple of times per year. As they come through the area, we provide information at the trailhead to notify people that sheep will be in the area so they know what’s going on and what to expect when they’re out there riding or hiking on the trail system. 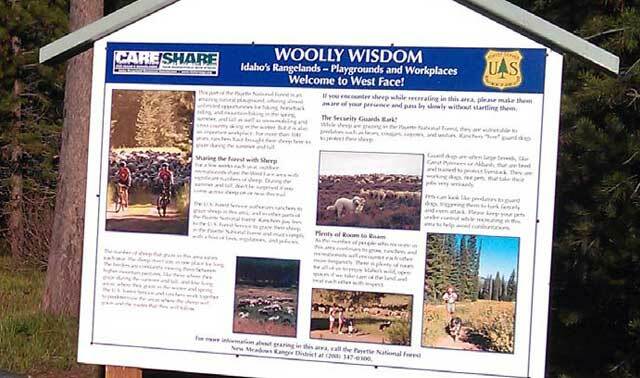 Similar Care & Share signage with information about sheep coming through recreation areas is posted at many trailheads throughout Idaho’s national forests. In the Boise area, IRRC issues press releases to the news media each spring to notify recreationists that domestic sheep are moving through, usually in late April or early May. The press releases often capture media coverage by local TV stations to help spread the word to recreationists. Care & Share signage gives recreationists tips on how to act around guard dogs and domestic sheep herds in the Payette National Forest near McCall. The primary issues are to explain to the public how to interact with sheep guard dogs and the importance of keeping pets on a leash. Ranchers use Great Pyrenees guard dogs as a non-lethal method of guarding sheep herds from predators such as wolves, coyotes and foxes. Mountain bikers can avoid conflicts with guard dogs by getting off their bikes and walking through the sheep. Jim Giuffre, an active mountain biker in Boise, says it worked for him. Kurtz has worked with the Blaine County Recreation District to take the Care & Share outreach program to a new level. Recreation District officials blended sheep turnout dates with public trails information on a new web site so people can see which trails might be affected at a glance. The web site, http://bcrd.org, is funded through a grant from the BLM. The site helps provide timely information about trail etiquette, trail status in the spring when conditions can be snow-bound and muddy, and livestock grazing. “There’s so many trails out there, and the sheep are in areas for such a small amount of time, so you can sit at home and check out the web site, find out where the sheep are and avoid them altogether,” Kurtz says. Hyde says the Care & Share campaign seems to be working. “We’ve seen a vast reduction in the number of complaints and the negative interactions just because people are aware that they may run into sheep or cattle when they’re out hiking, biking, camping, just enjoying our public lands,” she says. For more information about Care & Share, go to http://idahorange.org. 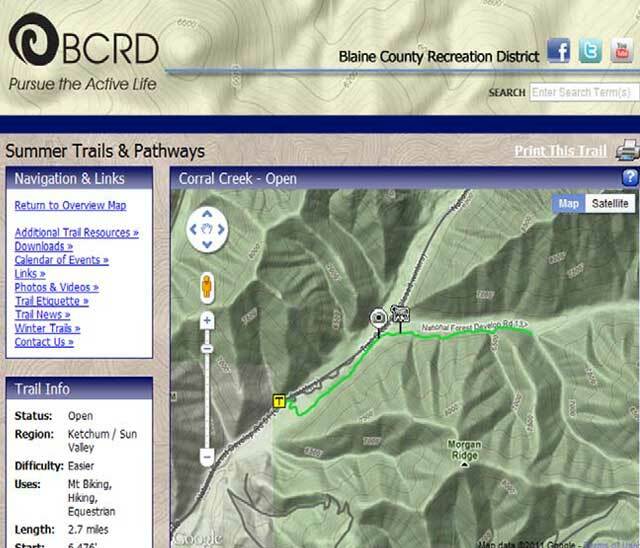 To see the new Blaine County Recreation District trails web site, go to http://bcrd.org.